Our Classic Crewneck Cardigan is an everyday, everywhere chameleon! A bit of an unusual construction with in-the-round set-in sleeves, this timeless beauty is knit from the bottom up and features a pretty short-row-shaped neckline and a handsome button placket. 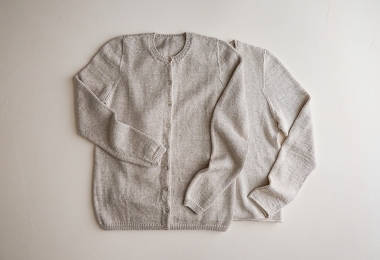 The shoulders are shaped with short rows and joined together with a simple three-needle bind-off. With some surprising details along the way, this knit will tickle the maker’s brain! Choose to make yours with ribbed or rolled edges and use either our beautiful Cotton Pure or Season Alpaca yarns... Or try both for year-round sweater options! Please click Product Details, above, for more information about materials, gauge, and sizes. NOTE: Choose from two different Purl Soho yarns. Each works perfectly for this pattern! 5 (5, 6, 6, 6, 7, 7, 7) skeins of Purl Soho’s Cotton Pure, 100% Pima cotton. We used Birch Bark. 6 (6, 7, 7, 8, 8, 8, 9) skeins of Purl Soho’s Season Alpaca, 100% super baby alpaca. We used Dove Gray. 8 (8, 8, 8, 9, 9, 9, 9) ½-inch buttons for rolled edge version, or 9 buttons for ribbed edge version. We used Purl Soho’s Mussel Shell Buttons. SAMPLE: The sweaters pictured here are size 38¾.